Gov. Ed Rendell presides as the new chairman of the National Governors Association. Right after Governor Ed Rendell took over as chairman of the National Governors Association, at the end of a four-day Centennial Conference of the NGA in Philadelphia, I went up to him and said I wanted to be the first to wish him "Mazel Tov." He laughed and said, "You are the first to wish me mazel tov!" 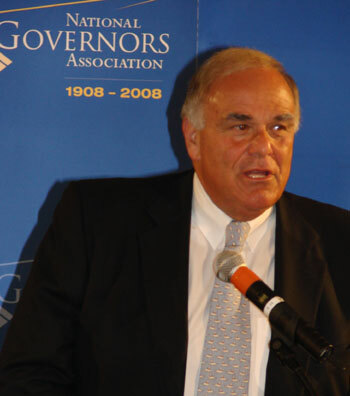 According to my research, Rendell is the second Jewish governor to serve as chairman. The first was Maryland Governor Marvin Mandel. The night before, I had asked Rendell what it will mean for the Jewish community to have him at the head of this important advocacy group. "The NGA does not tackle international issues,"he explained, "but all of the domestic issues which the Jewish community finds important are important to me." Rendell's approach to "tikkun olam" is to set as his Chairman's Initiative a focus on repairing and strengthening the nation's infrastructure. At a joint press conference with outgoing chairman Tim Pawlenty, governor of Minnesota, Rendell was amazing, with facts and figures about bridge collapses and deaths and disasters around the country, including the failure of the levees in New Orleans and the Gulf Coast after Hurricane Katrina, tragedies which could have been avoided if the federal government had assisted the states in investing in the repair and maintenance of our infrastructure. The most egregious example of federal neglect, of course, is Hurricane Katrina and the overwhelming loss of life and property in New Orleans and other Gulf Coast cities, losses which even three years later are glaring reminders of the inaction and indifference of the federal government. State Representative Daylin Leach held a fundraiser in Haverford recently which was billed as "a discussion about Judaism and the 2008 Elections," featuring Governor Rendell and Congresswoman Allyson Schwartz. Despite all the speculation about the possibility of Rendell's being chosen as vice presidential candidate by Senator Barack Obama, Rendell remains firm in his denial that there is even the remotest possibility of that occurrence. He adds, however, that in a couple of years, when his last term as governor is over, the would certainly be open to a Cabinet position in an Obama administration. And he plans to campaign very hard for Obama now, even though he was an ardent supporter of Senator Hillary Clinton during the Pennsylvania primary. The goal is to take back the White House and undo some of the damage inflicted by more than seven years of George W. Bush administration. The National Governors Association is billed as the most effective advocacy group in the nation, so it stands to reason that haveing Governor Ed Rendell, a member of the Jewish community, at its helm in this, a presidential election year, is a very important development. Even though the NGA does not take a position per se on international affairs, as their mandate is to focus on domestic problems, yet this past year, under the leadership of Minnesota Governor Tim Pawlenty, a Republican, the focus was on energy. And most of the Republicns present, either present or past governors, were critical of the Bush administration for its failure to act in more than seven years to reduce our dependence on foreign oil. As chairman of the NGA, Rendell will have a national platform. Remember when Bill Clinton was governor of Arkansas and chaired the NGA? That was the 90s, and Clinton worked hand in glove with Bush the Father to draft the Goals 2000 for the American public education system. Rendell may have the second half of his term to work with a Democratic president who might be a lot more receptive to his infrastructure initiative than the current President Bush is willing to be. Rendell also has had the national experience of chairing the Democratic National Committee under Clinton, and several prominent Jewish attorneys, Alan Kessler and Ken Jarin, co-chaired the DNC Finance Committee under Rendell. Mark Aronchick, another prominent Jewish attorney, is also part of Rendell's inner circle. Even before his recent ascension to the NGA chairmanship, Rendell was creating bipartisan relationships with Governors Arnold Schwarzzeneger and Michael Bloomberg, staging press conferences around the country, announcing the push for more federal funding to shore up roads, bridges, levees, railroad systems, and other neglected sections of our infrastructure. At the NGA, Rendell said that his Cabinet projected an $8 billion dollar cost, just to repair existing roads and bridges in Pennsylvania. That does not take into account building anything new. And, since the federal government has been derelict in supplying resources, each governor has had to search for funding sources on his or her own. In addition to the policy plenary sessions at the NGA, Rendell and First Lady Judge Marjorie O, Rendell were host and hostess, providing the best view that Philadelphia has to offer. The Kimmel Center, Verizon Hall, the Westin, Park Hyatt-Bellevue, Doubletree and Ritz-Carlton hotels were venues for various meetings and receptions. And the Rocky steps of the Art Museum served as venue for an opening reception for governors, the NGA staff, the spouses of the NGA participants, and other visiting dignitaries. Media have always found Rendell a favorite subject because of his wit and his knowledge. Chris Matthews, in particular, of all the cable news show hosts, enjoys interviewing the former "America's Mayor." So fasten your safety belts, boys and girls. This year is going to be a very interesting ride, especially for Rendell-watchers and political junkies.